The Hunt for History contest was easy, I learned a lot, and it was a great introduction to the databases. ABC-CLIO is calling for school library media specialists and social studies teachers around the country to join the 2012 “Hunt for History” and win valuable prizes such as iPads and subscriptions to the company’s suite of databases. To take the Hunt for History challenge, ABC-CLIO will open up its American History online database for a month to school library media specialists and teachers. Participants will then utilize this user-friendly and authoritative history resource to find and submit the answers to 10 questions about historical events, people, issues and dilemmas. The competition launches on April 2, and the deadline for submitting answers is April 30. Winners will be announced the first week in May. "The Hunt for History contest was easy, I learned a lot, and it was a great introduction to the databases." noted Deb Dominick, a social studies teacher at Susquehannock High School in Glen Rock, PA and a winner in last year's Hunt for History contest. "I have been extremely impressed with the content of the 4 databases we received and our students have made use of them this year." 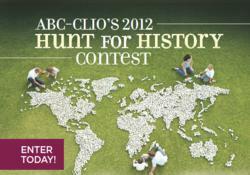 This year’s four Hunt for History grand-prize winners will receive an Apple iPad and a subscription to ABC-CLIO's 14 databases for one year. Another sixteen first-prize winners will receive a one-year school-wide subscription to any four ABC-CLIO databases. ABC-CLIO integrates three essential resources, A Library, A Textbook, and Perspectives, into each one of its 14 online databases for middle and high school students, making them the ideal answer for effective integration of the library into the classroom curriculum. Hunt for History is open only to teachers and school library media specialists in accredited, public and private schools in the United States and U.S. territories and is limited to one entry per individual. For more information, go to http://www.abc-clio.com/huntforhistory. Founded in 1955, ABC-CLIO is an award-winning publisher of reference titles, academic and general-interest books, electronic resources, and books for librarians and other professionals. The company, headquartered in Santa Barbara, Calif., publishes under four well-respected imprints. ABC-CLIO serves the history profession, history teachers, and students and scholars of history with a complete line of databases, books and eBooks, along with social studies reference and curriculum resources for middle and high school libraries and classrooms. Greenwood publishes high-quality, authoritative reference books and general-interest topics across the secondary and higher education curriculum. Praeger is widely regarded for scholarly and professional books in the social sciences and humanities, with emphasis in modern history, military studies, psychology, business, current events and social issues, international affairs, politics, visual and performing arts, and literature. Libraries Unlimited/Linworth publishes professional materials for librarians, media specialists, and teachers. For more information, visit http://www.abc-clio.com.